Several years ago I wrote a monthly humor column for a regional fishing magazine. One article in particular was titled simply “Partners.” In the article I lampooned the process for choosing a fishing partner for team events. I expressed, that mutual compatibility was of the utmost importance, and likened it to being as critical as choosing a husband or wife or a good hunting dog, but not necessarily in that order. Team bass circuits are quickly becoming one of the fastest growing sports in America today. Many experts believe that it will surpass even NASCAR in popularity among sports enthusiasts in the next few years. The sport continues to evolve with expanding coverage by the television networks as well as social media. Many high schools in the country now support bass tournament team programs. Often times those teams will continue to compete in college circuits, with many teams gaining notoriety and garnering sponsors during the process. Most notably of those anglers is back to back Bassmasters Classic Champion Jordan Lee who was dominating the college team circuit representing Auburn University with his brother Matt as recently as 2013-2014. In the team system an angler chooses the person that he will fish with in a specified number of “qualifying” events in the hopes of achieving enough points to fish against the other “qualifying anglers” in the “classic” or championship at the end of the season. The winners receive cash and prizes worth tens of thousands of dollars, and that’s just the qualifying events. The championship in some circuits will payout in the hundreds of thousands of dollars in cash and prizes. Not bad for a weekend fisherman! There are a number of quality team circuits for a person to choose from today. One of the most popular is of course U.S. Angler’s Choice. There are other compelling reasons to choose a team circuit over some of the other circuits that are also structured toward the weekend angler. For some anglers there are more advantages in fishing the team circuit than any other type. Consider, for example, the cost involved in fishing any tournament. There is gas for the tow vehicle and the boat. Also expenses such as maintenance for both vehicles, add to that the cost for lodging, food, tackle, and approximately $100 to $200 dollars entry fee per event. While many Professional fishermen are supported at least in part by a number of sponsors, most weekend fishermen don’t enjoy that benefit. Let’s face it; “Team Me” can cost the average fisherman thousands of dollars per year. Sharing those expenses with a partner is a much more practical proposition for those of us trying to live within a budget. Some teams own only one boat, therefore literally all expenses are shared including the pre-fishing trip expenses. Aside from the monetary element, there are other advantages of having a partner. The old adage “two heads are better than one” has never rang more true than when attempting to establish a pattern for catching the elusive Largemouth Bass. 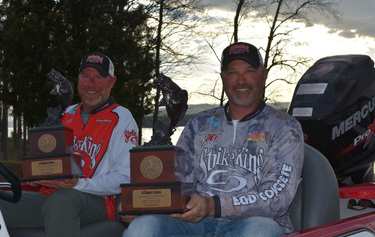 Teams can utilize the knowledge and experience of both anglers. One popular tournament tactic is for one angler to cover a lot of water quickly, usually from the front deck, with a search bait such as a crankbait or spinnerbait while the second angler completes the “one – two punch” by following up with a slow lure such as a worm or jig. Many teams are comprised of family members, i.e. father and son, husband and wife; thereby passing on the skill to the next generation and ensuring the future of the sport and the preservation of our natural resources. The teams that I most dislike to compete against are the ones that have been fishing together for many years. That tells me that they have figured out all of the dynamics of sharing a boat including deciding on their best plan of attack on any given day. In my opinion, the most successful teams not only have a high degree of confidence in their individual skill but also believe in their partner’s ability. With confidence at that level they are dangerous up to the very last minute.